signed and on verso signed, titled and inscribed "Aug. 1959 / "Commissioner Nicholson" / "60331/4" twice / "Walter Stewart" / "M.H. Long 11615 Saskatchewan Drive (1st House)"
A.Y. 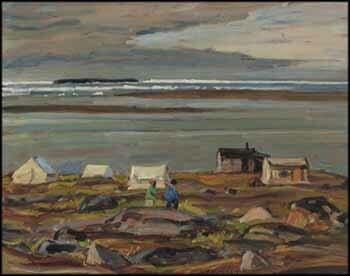 Jackson, upon discovering the North, developed a great affinity for painting there, stating, “Every chance I get I go by plane up into the tundra, into the Barren Land...I’m perfectly happy to be put down with my pack up among these rivers and lakes.” In both 1950 and 1951, Jackson was in the Coppermine River area of the Barren Lands, a bold country of bare hills with sparse dwarf birch and willow. Jackson was captivated by this unique land, depicting its tapestry of rocks covered by moss and lichen under a wide-open sky. His palette in this oil sketch is particularly rich, and close viewing reveals strokes of blue, green, orange, pink, mauve and red-brown. Jackson was hardy and adaptable, whether rough camping out in the rolling hills, eating caribou and occasionally encountering a wolf or a wolverine, or painting in small settlements such as this and meeting its diverse inhabitants, including native peoples. He had a passion for the Canadian wilderness in all its manifestations, and he was compelled to travel to its outermost regions to capture it.